Uff the name itself makes me drool. The fiery looking reddish noodles that don’t have heat but the red color is hypnotic. 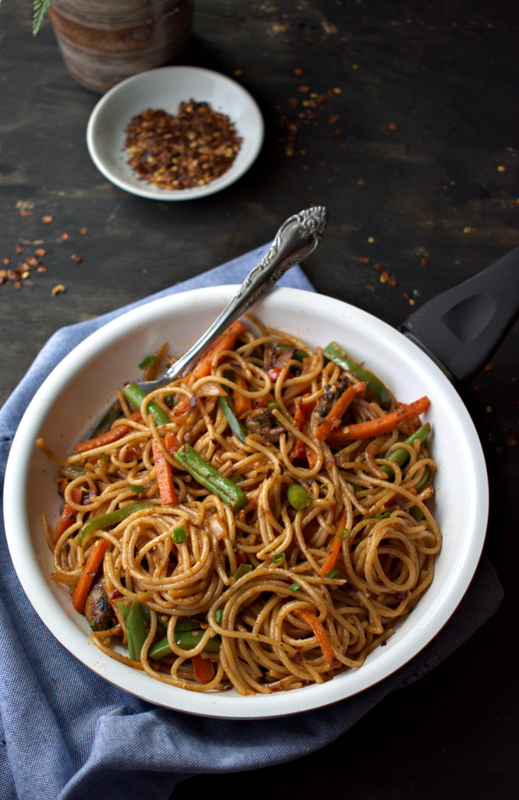 The pull of the fancy looking veggie loaded and slightly oily noodles with plenty of fried garlic is too hard to resist. And my husband had this irreversible pang of having these schezwan noodles few days ago and I thought why not. I gave into his temptations because I will finally be able to take some beautiful pictures of noodles. 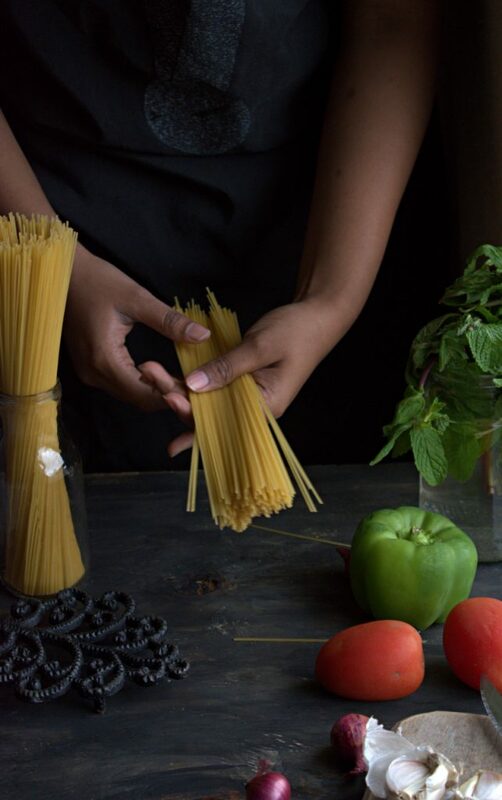 Of all the food photos,I have not had a chance of clicking pictures of noodles. So here are some of the pictures that I loved and enjoyed taking. I took all the time in the world to takes pictures of these noodles and ended up being late for dinner. However, I had the sauces ready so cooking went smooth. 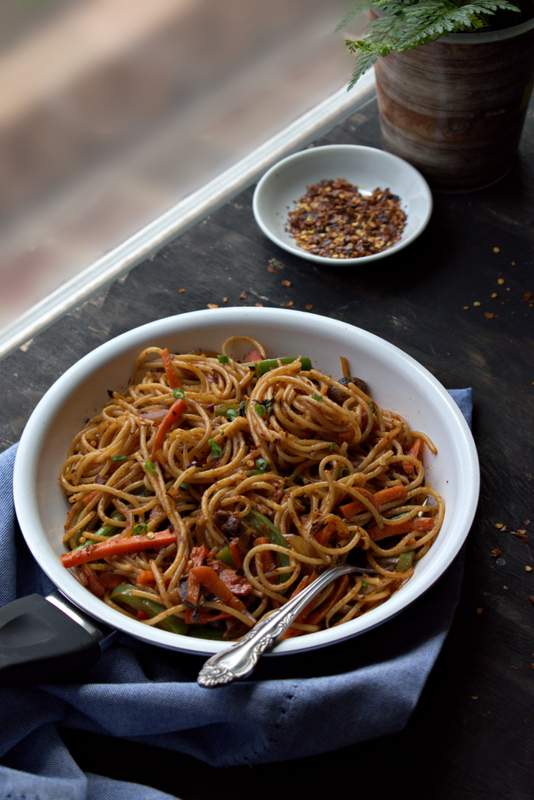 The street style Indo-Chinese noodles were always my go-to when in college and office. In fact, I remember asking my would be husband if he’s ‘ok’ with eating roadside chinese food and his eyes lighting up. Thankfully my husband shares the liking to visit those street vendors who make the tastiest food. Now that we are in US, the thrill of standing at the corner of the street and gobbling noodles is not possible, we do indulge ourselves in making some fancy Indo-Chinese food like I did today. The term Indo-Chinese food is used to all the food items that have roots in China but have been customised according to the Indian taste buds. Some of the funniest yet mouth watering variety of Indo-chinese is paneer fried rice, veg schezwan noodles, chinese bhel and many more. This fusion food was given birth by Indians who wanted to eat chinese food but in the comfort of Indian spices. 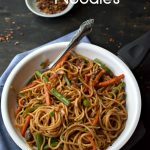 If you are craving for quick and easy indo-chinese food, I would be definitely recommend you to try my version of fiery and tasty schezwan noodles. 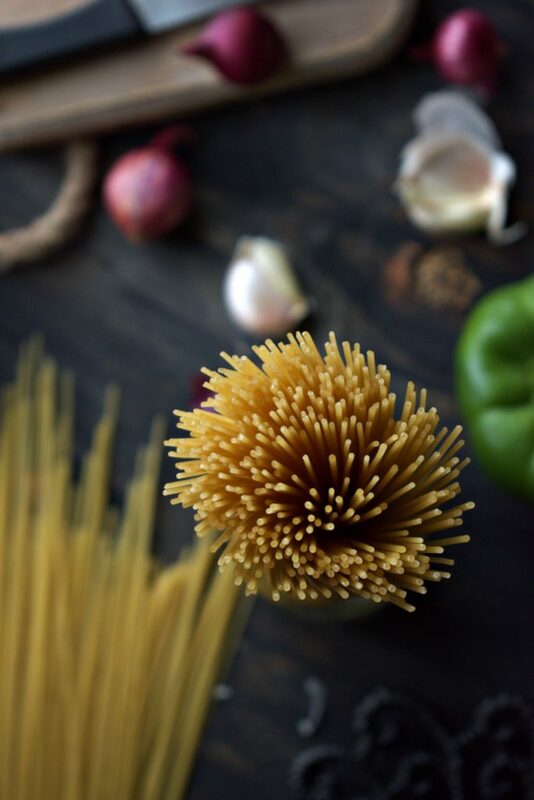 In a deep pan boil water on a medium flame and once it bubbles, add the noodles and cook until it turns soft and cooked.It will take around 10 mins to cook for regular noodles. Once cooked, strain the noodles and drain excess water. Add 1 tbsp of oil to the noodles and mix the noodles well. Meanwhile in a heavy bottom pan, add oil and heat on medium high flame. Once oil heats, add chopped garlic, ginger and saute until the raw smell has gone. Then add all the veggies at once and saute on high heat for 5 mins. The veggies don't need to be fully cooked just slightly roasted. If the veggies begin to burn, turn the flame to low. Add noodles to this veggie mixture. Also add schezwan sauce, soy sauce, salt and sugar. Stir everything together and let it sit on low flame for 5 mins. Sprinkle some chopped spring onions and chili flakes (optional) and serve hot. You can add 1 tbsp of garlic powder to get more pungent flavor. The choice of veggies is entirely your take. I like to add broccoli and sprouts too. You can find Schezwan sauce in Indian stores or you can alternatively use Red chili sauce, this works best too.